This is my "wearable mockup" kimono, meaning I didn't finish edges and was a bit sloppy on measurements, so it's wearable and looks fine but would fray like crazy if I washed it. The big thing it did was let me know what worked size wise and if I needed to make any adjustments. I could make the sleeves a little fuller if I wanted, which I may on the other one or two I plan to make before the con in a week and a half. Today I cut fabric for Kimono #2, it was quite easy since it's mostly rectangles. Looking at the scraps I even thought of a contrasting kimono to make using the leftover bits for collar, cuff and obi. Since it's mostly straight lines for sewing it also goes together quickly, so Kimono #2 should be done today or tomorrow, #3 done shortly after that. A #4 depends on time and if I already have the materials, I'm not going to spend more money for fabric if I can avoid it. Very nice. I agree that the sleeves should be fuller. A hakama would work. Looks good. I'll agree on the sleves as well, but all in all, good job! 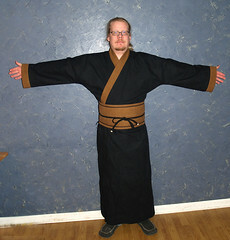 If you're curious about more kimono stuff, check out kimonoasobi.com. Well keep in mind male obi are easy :) Much less complicated than female obi's. Long thin sash, wrap it around and tie it. Viola! It's all one color, and no paisley at all! Hah! Does look good, though, despite its deficiencies.